Agricultural production benefits enormously from flower-visiting bees and other flower-visiting insects. Because of their supply of flowering plants and opportunities for nesting, hedgerows and the edges of forests represent important habitats for pollinators. 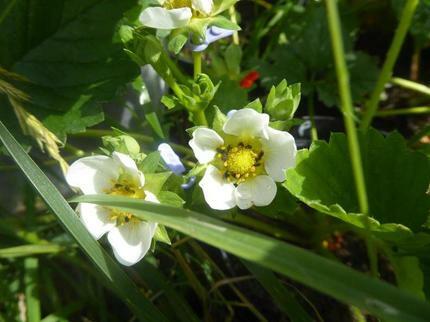 A team from the departments of Functional Agrobiodiversity and Agroecology at the University of Göttingen has investigated whether hedgerows and their proximity to forests might have a positive effect on the pollination of strawberries. The study showed that both the weight and the quality of strawberries increased when strawberry plants were placed at hedgerows or at hedgerows next to forests. The results were published in the journal Agriculture, Ecosystems & Environment. For the study, strawberry plants were placed in three different locations: hedgerows bordering forest; freestanding hedgerows; and grass strips isolated from hedgerows. "We wanted to investigate not only the positive effects of pollinators, but also possible negative effects from harmful insects," says Denise Castle, first author of the study, who is now working at the Julius Kühn Institute – Federal Research Centre for Cultivated Plants. "That's why we included not only flies and bees visiting the blossoms, but also the common pollen beetle, which eats blossoms, in the study." The isolation had a negative effect on the number of pollinators, but not on the densities of the common pollen beetles. The scientists were thus able to show that the connection to forest edges and hedgerows clearly has a positive effect on the pollination of strawberries. "The market value of the strawberries was highest at just under 15 euros per 1000 fruits on the hedgerows connected to forest edges and decreased significantly with increasing isolation," explains the Agroecologist Dr. Ingo Grass. "1000 fruits harvested in the grass strips achieved a market value of only 9.27 euros." "With our study, we were able to demonstrate that hedgerows are important habitats in the agricultural landscape. They can enhance the connectivity between habitats and adjacent crops and thus also contribute to increasing fruit quantity and quality," concludes Professor Catrin Westphal, Head of the Division of Functional Agrobiodiversity.